Unless you’re on watch, in which case, stand tall and be vigilant! Named after General Duncan Lamont Clinch, a war hero in the Seminole War and a congressman from Georgia, Fort Clinch was built in 1847 as an antebellum fort with coastal defense in mind. When the Civil War broke out, Confederate forces occupied the fort. After Union forces staged a blockade off the coast of Fort Clinch, Robert E. Lee decided that the fort was no longer worth defending and surrendered it to the Union. During the entire war, Fort Clinch was never fired upon or fired from. In 1869, Fort Clinch was officially placed into caretaker status. Since Fort Clinch has never been involved in a major conflict, the remains of the fort are still very much preserved. This preservation offers a unique opportunity for visitors to enter the world of a Civil War soldier. Another unique aspect of Fort Clinch is the historians, who patrol the fort and don full Union uniforms, are in the mindset of a Civil War soldier–don’t hesitate to approach them and ask questions! Frank, a park ranger and interpretive historian dressed in full Union blue, is certain that Fort Clinch is offering something unlike anywhere else. Visitors can even walk into the Quartermaster’s office and see authentic Union gear and uniforms neatly folded and stowed. Gardening tools and other maintenance equipment can be found just around the corner. Walk up the sides of Fort Clinch and stand next to the gigantic 10-inch Rodman Cannons. Stare out across the Cumberland Sound and imagine what it would have felt like to stand the watch at Fort Clinch. This is also a great spot to turn around and look down into the fort grounds beneath the 35 star US flag. Don’t miss your chance to experience history standing still at Fort Clinch State Park. Fort Clinch is located at 2601 Atlantic Ave, Fernandina Beach, FL 32034. 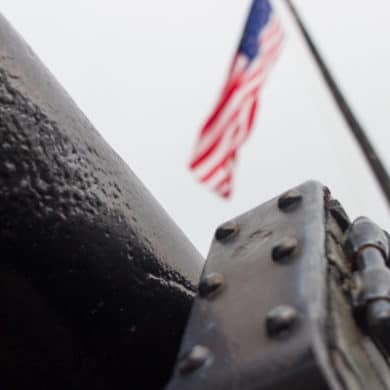 For more information, visit the Fort Clinch website or call (904) 277-7274.